A before and after image showing the original film on the right and the restored, colorized image on the left. 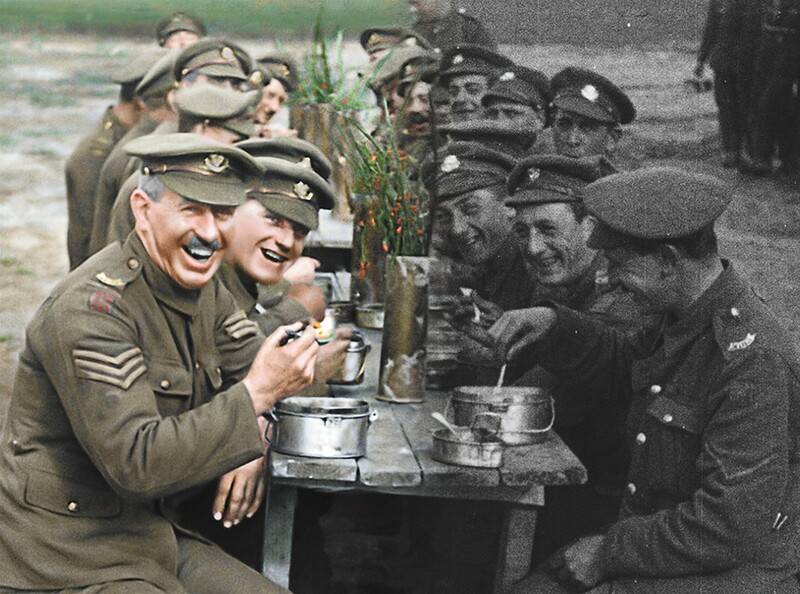 Note: They Shall Not Grow Old has been shown in occasional one-off screenings since December, but it begins a regular run at River Park Square this weekend. So London's Imperial War Museum went to Peter Jackson and said, "Look, we have all this amazing archival footage from World War I. Can you do something cool with it for the Armistice, the 100th anniversary of the end of the war?" And the BBC said, "Hey, we also have a ton of audio of WWI veterans talking — in, like, the 1960s — about their experiences during the war. You could use that." And Peter Jackson, of The Hobbit and Lord of the Rings fame, said, "You got it," and They Shall Not Grow Old is now here. Technically, They Shall Not Grow Old is a marvel, a use of CGI and who-knows-what other computer wizardry to bring to life the world of a century ago, and in a way that feels more natural to our eyes today than the jittery, unaltered early film now appears to us. Footage of everything from soldiers queuing to volunteer for army service as the war broke out in 1914, to tanks rolling over trenches toward the end of the war, has been colorized faithfully. The frame rate has been stabilized so that motion is smooth and realistic. And it's all even been extruded in 3D for the theatrical versions. Ambient sound has been added, sometimes with actors providing dialogue extrapolated from lip-reading the faces in the original footage, which of course would have had no sound. But They Shall Not Grow Old never transcends its gimmick. And yes, it is a gimmick — one used respectfully and to honest, heartfelt purpose, and without overwrought sentimentality or any hint of tackiness. But this isn't a movie: It's a museum exhibit, one that you might sit and watch for a few minutes at, say, the Imperial War Museum, and be deeply moved by. And yet there are limits to that. There's no story here, no narrative beyond the progression of the war itself. There are no characters to speak of. Even the narration — which comes solely from the reminiscences of survivors decades on describing everything from how they lied about their ages in order to sign up, to the camaraderie and the adventure of the war, to the discomfort of the mud and the horrors of the gas — is provided by voices that are not identified, and so we cannot even connect them from one sequence to the next (if indeed any are even the same from one sequence to the next). The complex messiness of the war has been flattened out into a video photo album. The original print version of this article was headlined "War Wounds"
They Shall Not Grow Old 3D, They Shall Not Grow Old, They Shall Not Grow Old 3D, They Shall Not Grow Old and They Shall Not Grow Old are not showing in any theaters in the area.